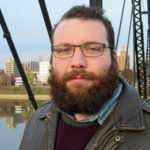 Alexander J. Chadwell is a Harrisburg, Pennsylvania-born and raised, New York City-based composer of post-genre music. Exposed to a vast array musical styles from a young age, his music is incapable of being categorized into traditional genre boundaries. He often works at the intersection of technology and acoustic instruments. A firm believer in the power and joy of music, Chadwell is an active teaching artist in New York City schools. He’s worked with organizations such as Brooklyn Arts Council, St. Nicks Alliance, the New York Philharmonic’s Composer’s Bridge program, Bethel Woods Center for the Arts, the Center for Arts Education, Highbridge Voices. Chadwell attended West Chester University and Mannes School of Music. He is a member of ASCAP.